The chaotic nonprofit capital marketplace is trying to organize itself to deploy billions of dollars much more effectively. It has miles to go, but it’s heading in some encouraging directions. The intrepid Social Innovation Fund (SIF) and the just-launched Social Impact Bond (SIB) are two of the most promising. At next week’s Social Capital Markets conference (SOCAP10) I’ll be moderating a panel on my favorite topic, “Scaling Social Impact,” with Shawn Bohen from Year Up, Jennifer Davis from the National Center on Time and Learning, and Lance Fors from the New Teacher Center, which rolls down the “Tactical Philanthropy” track curated by Sean Stannard-Stockton. Beyond that, I’m particularly looking forward to hearing more about Social Finance’s Social Impact Bond (SIB), which is surely one of the most promising developments I’ve seen in recent years. (Social Finance’s Emily Bolton will be leading an SIB “working session,” whatever that means, at SOCAP.) Here’s why. I wish I had a nickel for every time I’ve quoted these wise words from Harvard Business School’s Michael Porter: “Philanthropy is decades behind business in applying rigorous thinking to the use of money.” The social sector is stunningly ineffectual in so many ways at managing the $300+ billion it takes in every year. We raise money based on telling stories about what we try to do, not on what we accomplish, thereby rewarding skillful storytelling rather than building productive organizations. We invest next to nothing in capacity building, making it impossible to systematically measure or improve performance. We spend virtually every dime we raise, with almost nothing saved for a rainy day or accumulated for long-term needs. We eschew best accounting practices, so few nonprofits are “bankable,” that is, they don’t have ready access to affordable working capital based on the quality of their well-managed balance sheets. The result is an appallingly low bang-for-the-philanthropic buck. Still, the social sector is nothing if not resilient. We have conducted numerous experiments of some size and duration that provide encouraging and sometimes even convincing evidence that we now know how to solve some of our most difficult social problems. Philanthropy, volunteering and community engagement seem to be rising relentlessly even in the face of cyclical headwinds. The art and science of social entrepreneurship has gained an enthusiastic following in both undergraduate and graduate education and isn’t likely to let go. Somehow, a tiny percentage of nonprofits manage to endure and distinguish themselves with mature management teams delivering proven innovations through relatively robust infrastructures and sustainable finances. Over the last ten to twenty years, these few exceptions to the rule have become sufficiently numerous that it has become impossible for forward-thinking funders to overlook their accomplishments, to the point that the crustiest segment of the social sector, institutional funding, has evolved a cadre of innovators. If further proof were required that social innovation is becoming institutionalized in the best sense of the term (beyond the success of SOCAP itself), that proof arrived this summer with the launch of the Social Innovation Fund. To me, the significance of SIF resides in its structure. A new federal agency carves out a minuscule amount of taxpayer funds, $50 million, for multi-year deployment against defined performance objectives through experienced nongovernmental intermediaries to innovative nonprofits that can demonstrate their effectiveness from documented evidence through a competitive solicitation process. The agency oversees the intermediaries and the intermediaries oversee the nonprofits. Even though SIF triples the corpus to $150 million through matching funds raised by both the intermediaries and the nonprofits, neither social nor financial innovation is the main object of the exercise. Rather, SIF is about “scaling what works”: expanding the delivery of proven social innovations beyond what the nonprofits could achieve on their own, even with the same amount of increased funding. As I have written before, producing innovation and spreading innovation are two quite different things, and the former does not inevitably lead to the latter, conventional wisdom to the contrary notwithstanding. If any magic should emerge from SIF, it will be found somewhere in the disciplined and purposeful application of expertise about scaling and the power of collaboration through communities for shared learning. So SIF takes a small amount of federal money, triples it in conventional ways, and then processes it among carefully vetted collaborators to substantially extend the footprint of social innovation. 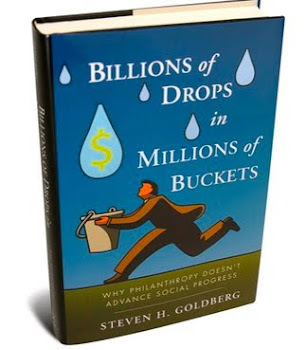 The nonprofits, the intermediaries and the co-funders are all proven, brand-name entities that pose little risk individually, but collectively they’re a high-wire act trying to combine tiered expertise, evidentiary rigor, and careful performance management, to try to make 1 plus 1 equal 3, or at least 2 1/2. Will the intermediaries add value? Will the co-funders play well together? Will the nonprofits grow more this way than they would through simpler and quicker funding increases? Can SIF mount a convincing case for continued and increased funding? Will SIF eventually produce a transformative model for scaling social impact? Given what the distinguished sponsors and participants have accomplished so far, I think the endeavor has quite a strong likelihood of success, but SIF wouldn’t be needed if scaling were easy. SIF is undeniably a commendable cross-sector initiative designed to draw on the complementary strengths and resources of public, private and nonprofit stakeholders, and it’s a lot cheaper than the Large Haldron Collider. But, really, why go to all that trouble? Isn’t that a rather roundabout way to promote growth? What do intermediaries contribute other than matching funds? Consider one example: the joint application of the Strive Partnership/United Way of Greater Cincinnati, which received a $2 million, 2-year SIF grant. The Roadmap establishes benchmarks children must reach in order to navigate each transition point, together with indicators of progress that academic and student/family support must achieve to reach those benchmarks. For example, to succeed at entering kindergarten, a newborn must have a “stable relationship with a strongly involved parent or caregiver ... who understands developmental milestones” so that the child “responds to parent/caregiver high-quality talking, reading and singing, ... uses exploration and discovery to understand surroundings, ... develops letter knowledge and reading sensitivity, ... and participates in high quality preschool.” When such a child enters kindergarten, she “exhibits learning-related skills such as self-regulation, social competence, self-esteem, and motivation.” Without those skills, children cannot succeed in elementary school and beyond. Implementation is coordinated under the umbrella of a two-phase “Strive Endorsement Process.” Social service providers participate in “Student Success Networks” that meet informed criteria for successful collaboration: alignment with the Roadmap goals; inclusion of all appropriate organizations and willingness to expand as additional organizations are identified; wide support in the community; commitment to being data-driven; and willingness to publish progress and share data with the community. For example, the Mentoring Student Success Network includes 13 organizations that provide some type of mentoring, whether it is one mentor to one child, one mentor to a group of children, or one mentor to a classroom of children, of which some organizations focus on certain areas of the city, certain schools, or on children in certain circumstances. Strive oversees 12 separate Student Success Networks corresponding to each of its priority strategies: Quality early childhood education; Home visitation (early childhood); School-based resource coordination; Mentoring; Drop out recovery; Health and wellness; Arts; After-school programs; Youth employment; Tutoring; College access; and College retention. Clearly, without the Strive Partnership, the community of Greater Cincinnati social service providers could not possibly have undertaken the rigorous work necessary to unearth the essential developmental requirements captured in the Student’s Roadmap to Success. Even if such a dazzling blueprint were magically available from some other source, they could not have organized themselves to provide all of the coordinated academic and student/family supports needed to achieve them. The Strive Partnership understands that scale is not an additive process in which good organizations do more and more of what has worked before, accumulating success and growing incrementally over time. Rather, scale is an exponential process by which good organizations acquire new capacities and develop new systems for delivering innovation in order to grow by orders of magnitude. Like metaphorical caterpillars that change into butterflies, scaling organizations transform themselves in stages that comprise differences in kind and not merely in degree. Intermediaries like Strive and the 10 other SIF intermediary grantmakers enable that transformation. Nonprofits that grow incrementally and organically are merely larger than they used to be; nonprofits that scale are larger and different from what they were before, either by themselves, or by becoming an essential component of a functioning network in which the whole becomes greater than the sum of the parts, like the Strive Partnership than it can accomplish things collaboratively that the components could not produce themselves. Wonderful, you say, Strive is terrific. But what does SIF bring to the party other than some additional funding that any federal agency could find under its couch cushions? SIF is an intermediation factory. One of the defining characteristics of social entrepreneurship is the adoption of more business-like practices. When people say nonprofits should be run more like businesses, the SIF / Strive / United Way is a shining example of what that looks like. This arrangement is quite new in the social sector but completely familiar to high-growth business enterprises. However, for-profit companies like GE, the original developer of the Six Sigma process, don’t have the expertise or relationships to adapt or introduce the intermediation model in ways that take into account important differences between for-profit and nonprofit organizations working to solve stubborn and complex social problems. The Strive Partnership and SIF have that expertise and those relationships. This self-organizing process is being invented as we speak, but it sure looks promising. The United Way began a major transformation in 2005 which it called the “Agenda for Community Impact,” which drastically refocused United Way’s funding strategy to support a few set priority outcomes, and required programs seeking funding to demonstrate through program evaluations not only that they were producing positive results, but that those results contributed to the achievement of the priority outcomes. The Strive Partnership was launched in 2006; just four years later, Cincinnati Public Schools have increased kindergarten readiness by 9%. Can substantially 100% readiness be far behind? I think not. What SIF hopes to do for scaling social impact, SIB hopes to do for scaling social funding. As we’ve seen, SIF involves real rocket science when it comes to scaling impact, but not in terms of financial engineering, which relies on simple matching grants. That’s where the Social Impact Bond comes in. The SIB, in both its design and initial implementation, is quite modest in scope, but it is potentially seismic as an innovation of social finance. The SIB is one of those simple but profound ideas that makes you wonder why no one thought of it before. Millions of people face incapacitating social problems that produce disastrous and expensive consequences. For a variety of reasons I explore in my book, our track record over the last several decades in responding to these problems has been poor and declining, and the adverse consequences and their associated costs have steadily increased across the board with only minor exceptions. This bleak outlook is not likely to improve in the face of the direst economic conditions that most of us have ever seen. A common theme of effective social innovations is finding ways that failing institutions like public education, health care and the labor market can be fortified to serve many of those who currently fall through the cracks, so that people and communities that have fallen behind can become economically and socially self-sufficient. Through intensive, targeted and cost-effective interventions, at-risk students can graduate from high school and attend college, single mothers can raise healthier children and disconnected youth can become employable. Not only do the participants get back on track, but taxpayers avoid the added costs from trying to mitigate the collateral social damage. The SIB starts with the simple premise that it should be less expensive to prevent problems rather than fix them after they occur. This is not an entirely new idea, but it has been devilishly difficult to operationalize for a couple of headache-inducing reasons. First, government has no choice but to pay at least some of the staggering costs to respond to problems like children without health coverage, families without adequate food or shelter, and unemployed youth, but nothing except prudence requires it to pay for programs that might prevent those problems. In fact, the more money that has to be spent on the back end to deal with social and market failures, the less money is available, politically and otherwise, for preventive programs on the front end. Second, even if prevention programs were funded, how could they prove the amount of savings they generated and that the savings were attributable to the programs? These were some of the problems that plagued the Bush administration’s failed “share-in-savings” program, which sought to reduce federal outlays by entering contracts that would pay vendors only to the extent that they produced quantifiable savings. Contractors were understandably reluctant to assume the risks of up-front investments, particularly when the difficulty of establishing cost benchmarks would create doubts about whether and how much much savings were produced. SIB responds brilliantly to both risks with the same answer: private investment. Instead of asking government agencies to pay up front for preventive programs that might not work (and potentially require the government to pay again later to address any failures) or asking underfunded nonprofits to assume the risk of nonpayment if savings are not realized, SIBs attract private funding for prevention programs by agreeing to pay investors (bondholders) a financial return if, when and to the extent that savings are produced. This first issue will fund social organisations working to reduce the re-offending rates of short sentence male prisoners leaving Peterborough Prison. The Ministry of Justice has agreed to make payments to investors in the event that re-offending is reduced below an agreed threshold. Re-offending is an area where preventative work could lead to a better society and save the taxpayer money. Of the 40,200 adults on short term sentences, an estimated 60% will go on to reoffend within a year of release, at a significant cost to the taxpayer and society. During the Peterborough Prison pilot, experienced social sector organisations, such as St Giles Trust, will provide intensive support to 3,000 short-term prisoners over a six year period, both inside prison and after release, to help them resettle into the community. If this initiative reduces re-offending by 7.5%, or more, investors will receive from Government a share of the long term savings. If the SIB delivers a drop in re-offending beyond the threshold, investors will receive an increasing return the greater the success at achieving the social outcome, up to a maximum of 13%. Of course, if the project reduces re-offending by less than 7.5%, of course, bondholders will receive a lower financial return, potentially none. The social service provider, St. Giles Trust, already has an impressive track record of reducing recidivism of this target population and generating substantial savings through a field-tested intervention. Research by Frontier Economics estimated that the program saved £10 in reduced costs for every £1 spent on prevention programs. The primary risk of SIBs is placed right where it should be: on the viability of the funding mechanism, which has been the obstacle to program growth in past efforts. Project risk is further managed by the establishment of reasonable benchmarks against which savings will be measured. Government-funded share-in-savings contracts put public dollars at risk, so estimating both current expenditures and future cost reductions are subject to public scrutiny by regulators, legislators, auditors, and other financial watchdogs, inviting protracted debate, gridlock and second-guessing both before and after the fact. But when only private funds are at risk, the parties can negotiate any savings arrangement they deem reasonable. Here, the parties have agreed to what they believe are achievable targets for reduced recidivism and plausible estimates for corresponding savings, without getting lost in the weeds of either calculation. Initial funds secured will fully fund operations for two years, giving the parties breathing space to launch and establish reliable operations. While the program will be conducted over a six-year period -- a period of time that is long enough to enable the providers to build capacity and improve service delivery operations -- both the initial investment and the financial returns are drawn down and paid out, respectively, incrementally over that time span. Thus, investment capital will be drawn down over six years, and payments to investors (if any) will be made at the end of years 4, 6 and 8. By focusing on short-term offenders and a one-year intervention model, the program can serve six successive cohorts of 1,000 offenders over the six-year project. An investor-funded capital-raising fee of 2.5% for a skilled financial intermediary to manage a new social investment instrument issued on terms that include reasonable and customary rights and protections for investors. A 10% performance fee, to be paid only after investors are fully repaid, to reward the achievement of the desired program outcomes, reduced governmental expenditures. Investment fund managers believe there would be considerable consumer interest in investing in Social Impact Bonds once a track record has been established and sufficient scale of investment opportunity exists. Ultimately, Social Impact Bonds could become a new social asset class, comparable to microfinance, enabling an unprecedented flow of investment into addressing social issues in the UK and elsewhere. It does not take great powers of imagination to conceive of this new asset class as a tradable security with all that entails, including availability to both mass market customers such as donor-advised funds and institutional investors such as insurance companies and pension funds, as well as trading on secondary markets to create liquidity and reduce risk. And if SIF and SIBs seem like exciting developments in their own right, just think about the possibilities if both experiments succeed over the next several years. The potential benefit of combining these innovations for scaling impact and scaling funding could be quite breathtaking.